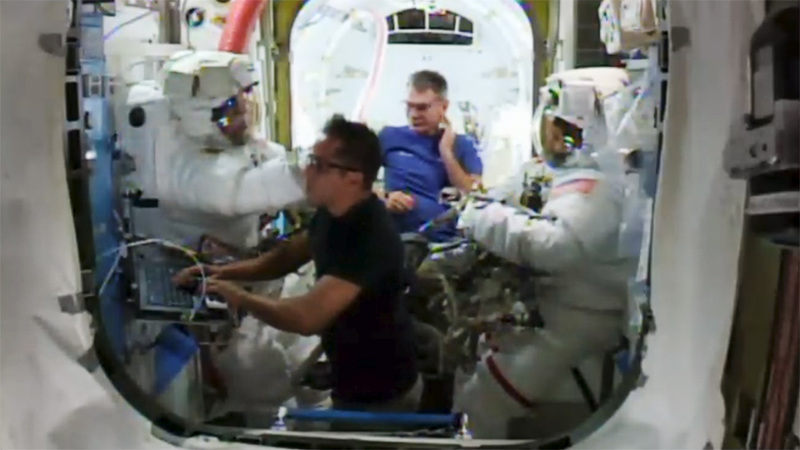 Spacewalkers Mark Vande Hei (left) and Randy Bresnik (right) are assisted by NASA astronaut Joe Acaba (foreground) and European Space Agency astronaut Paolo Nespoli (background). Two NASA astronauts switched their spacesuits to battery power this morning at 8:05 a.m. EDT aboard the International Space Station to begin a spacewalk planned to last about 6.5 hours. Live coverage is available on NASA Television and the agency’s website. Expedition 53 Commander Randy Bresnik and Flight Engineer Mark Vande Hei of NASA will replace one of two Latching End Effectors (LEE) on the station’s robotic arm, Canadarm2. Canadarm2 has two identical Latching End Effectors used to grapple visiting cargo vehicles and payloads, provide data and telemetry to the rest of the Canadian-built Mobile Base System and the unique capability to “walk” from one location on the station’s truss to another. This is the third spacewalk of Bresnik’s career and the first for Vande Hei. Follow @space_station on Twitter for updates on the station and crew activities. For more information about the International Space Station, visit www.nasa.gov/station. What is a space walk? “Spacewalk” is a nickname for the fancier, more official term Extra-Vehicular Activity (EVA). An EVA occurs when an astronaut leaves the pressurized environment of a spacecraft. This requires wearing a spacesuit that protects the astronaut from the extreme environment of outer space. The official term for a U.S. spacesuit is Extravehicular Mobility Unit (EMU). Hi I am from northeast middle school we are watching your live! I was wondering how the cameras still work in space and how its staying live. The cameras are protected by radiation and heat shields. The video data is downlinked using powerful satellites that are in near constant communication with the space station. The astronauts are attached to the space station with tethers. Their spacesuits have jet packs they can maneuver in the unlikely event a spacewalker becomes untethered from the station. Hi! I am a student at parkway northeast middle school! I want to know why they are actually out there repairing this. Is there new technology you need to install? And also, how long do the astronauts stay in space? Hi! Students on 7 silver at Northeast Middle School are currently watching your LIVE video on the space walk. We have a few questions for you, 1. How are you keeping a LIVE connection in space? 2. What are they fixing? 3. How many cameras are currently on space and recording? 4. What does it feel like in space? 5. Did they launch this spaceship today or has it been in space? 6. What is that ships name and when was I built? Thank you so much from 7 silver at Northeast Middle School in Missouri! #askNasa What is the purpose of the robotic arm? The purpose of the Canadarm2 robotic arm is to help with the assembly and maintenance of the space station. The Canadarm2 also captures, installs and releases a variety of resupply ships. Hi I am a student from northeast middle school I was wondering how the cameras stay live in space.